As needed, you can customize the medical alerts that can be attached to patients. Changing a medical alert does not affect patients with that medical alert already attached to their records. 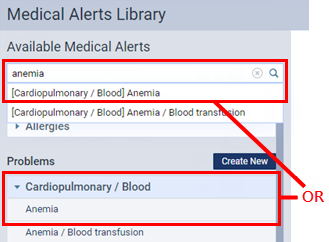 Change the category, description, importance level, and/or status of the medical alert. Condition - Type a description of the medical alert. It can be up to 60 characters long. Category - Select a category for the medical alert. 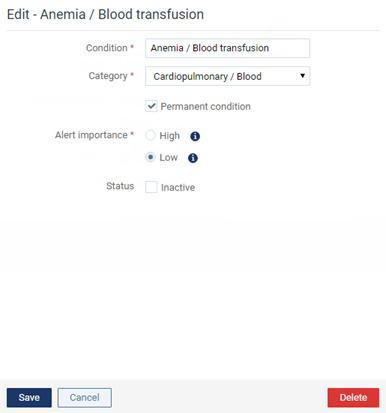 Permanent condition - If this medical alert will usually be permanent for patients to whom you attach it, select this check box to have the Permanent condition check box selected by default when you are attaching this medical alert to a patient. However, you can clear the Permanent condition check box for a patient's medical alert as needed. If a medical alert is not marked as permanent, you can set it as expired when applicable. High - For a patient with this alert attached, a message that describes the patient's condition or disease will appear each time you access the patient's information, and the Medical Alert icon will appear where applicable. Low - For a patient with this alert attached, a message will not appear when you access the patient's information, but the Medical Alert icon will appear where applicable. Status - Inactivate or reactivate the medical alert.